Now it will be sent to a model stitcher this week. 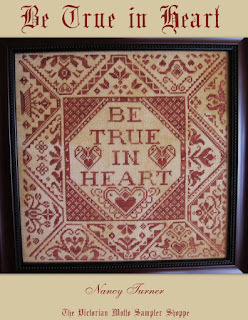 Finished size on 32ct linen is 11.5 x 11.5" and they fit perfect in a standard 12 x 12 frame. Easy and inexpensive framing makes it nice. These are listed in my ebay store or available direct from me. Thanks for listening.......or reading.....about my latest pattern. Be sure you sign up for all the give-aways for Christmas in July in my previous posts. I think so.....if I could just exercise as I sit.....it would be perfect! Your new Quaker is lovely! Thank you Jacquie....nice to be back! Your samplers are simply amazing Nancy. Beautiful samplers! Please include me in your linen giveaway. How generous of you. They go very well together. Nice job! Beautiful new pattern I love the colors of the fabric too I am an aida girl please enter me I am including this on my blog! Thank you and hope your knee heals quickly! 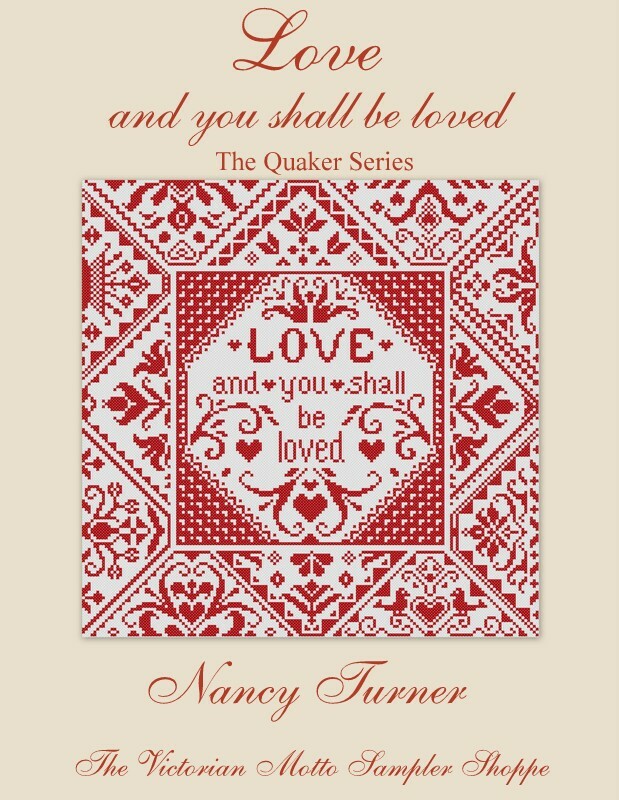 Your new Quaker pattern is beautiful Nancy! Both of them are lovely. Thanks Annette, I truly love what I do. Love this new Quaker! The red is really striking. Hope you are feeling better. love new quaker pattern! You are truly blessed with amazing talent! Yes it would....should apply to all of us. It is one of my favorite mottoes and hangs right above my desk. 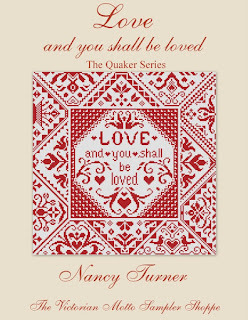 Love your new Quaker...as always..it is gorgeous. How wonderful to think of having this as part of the supplies needed to use to stitch up me of the many charts I ordered from you! I hope you win the drawing, good luck! I may have accidentally hit the delete button...I would love to win what beautiful fabric! Mi have several of your charts waiting and this would be just the ticket! Thank you for the opportunity. Love everything you have. Thanks!!!! Simply beautiful!! These would be a delightful addition to any house. Thanks for sharing them with us and for the chance to win your great offers for Christmas in July. I love these! They are both beautiful! Quaker samplers are my favorite.